No area is inaccessible with the AbVac Grit Recovery Unit from Airblast Eurospray. 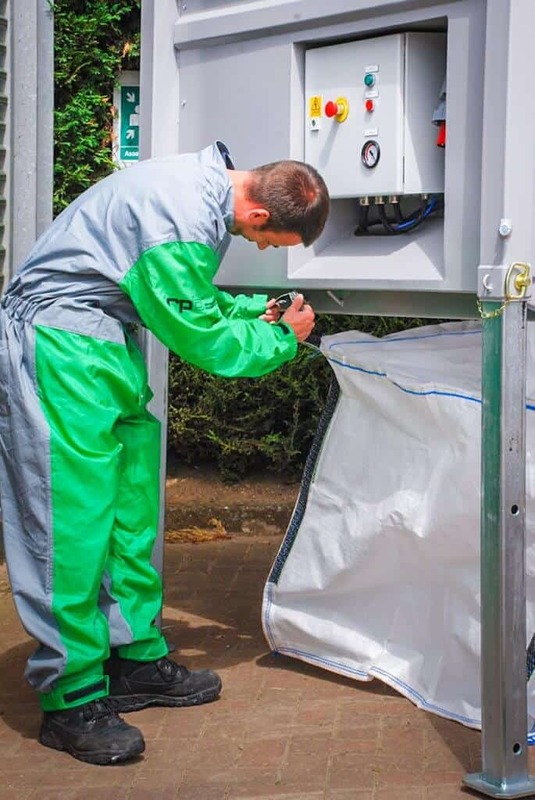 Perfect for use in restricted spaces such as city centres or for difficult-to-reach locations like bridges, water tanks, and gas towers, AbVac is one of the most portable media recovery devices available anywhere in the world. AbVac reclaims up to 5 tonnes of blast media an hour and is highly effective with extended hose lengths. It has low power requirements, making it a low-noise device that is simple to use. The AbVac is an electric-powered suction unit that is mounted onto a rigid stand, equipped with retractable legs. The unit is designed for the collection of dust and debris up to 50mm into a builder's bag. 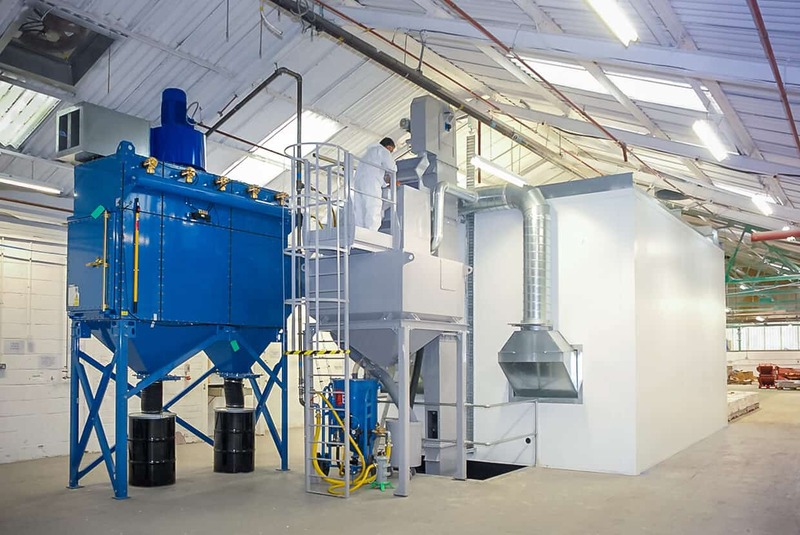 It can also be combined with an abrasive storage hopper, allowing recovered abrasive to be reused. As an enclosed recovery system, operators can safely work without mask or goggles. The retractable legs make it easy to move around and they allow the discharge outlet height to be adjusted to fit any size of builder’s bag. 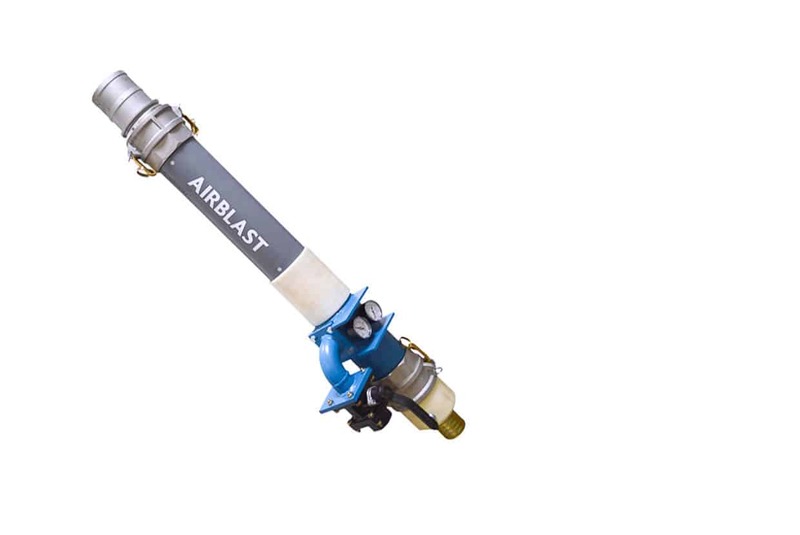 Due to its portability, the AbVac is often used as a free-standing suction unit with the connection of a 3” or 4” hose. However, it is also suitable for fixed installations, connected to a fixed, installed pipe system with multiple suction outlets. AbVac also boasts an automatic discharge feature. 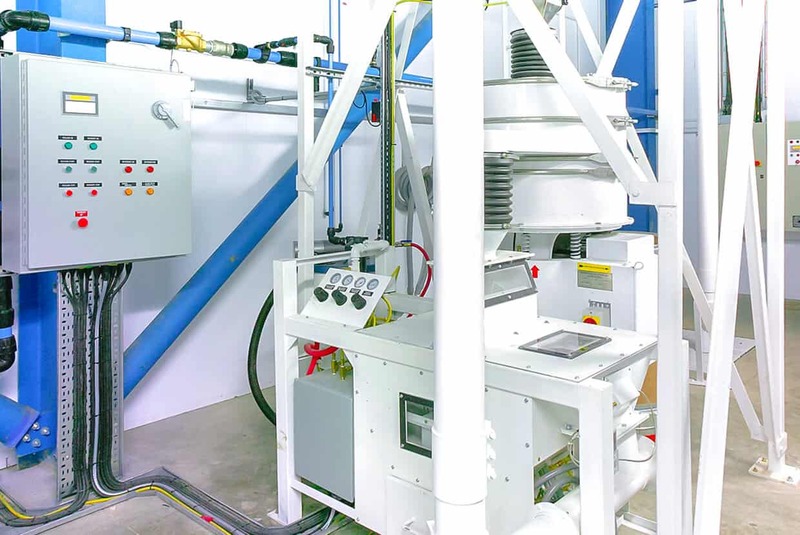 This allows operators to work continuously, providing huge efficiency gains in a range of scenarios and particularly in locations where manual emptying is impractical. As the unit is designed and equipped with an outlet for connecting a builder’s bag, it can be used without a separate drop out box. The unit requires no compressed air and offers efficient airflow per kW. The high suction capacity, together with its flexible discharge system, makes the unit very useful in most grit recovery situations. Thanks to its flexibility, the AbVac unit can access areas that would otherwise be inaccessible due to hose length. The unit is easily manoeuvred using a standard forklift truck or crane. By utilising a drop out hopper, recovered media is delivered to a silo, while dust is redirected to the builder’s bag. Silos are available in several sizes to feed up to four blast machines. The unit is designed to recover up to 5 tonnes of media per hour based on expendable abrasive. The vacuumed material is first separated in a specially designed fall chamber hopper with inlet wear protection. In this section, all heavier or larger material falls to the bottom of the hopper. From here, the air stream continues to the main filter system, where the remaining fine, airborne dust is separated. Collected material from both the above sections is commonly collected in the conical hopper. Discharge of material is made via the automatically operated balance valve at the bottom of the hopper. Discharge is executed parallel to each filter cleaning sequence, which normally takes place every 30 minutes. Filter cleaning is automatic and executed by a filter cleaning valve (ATM) located between the filter and the vacuum pump. When this valve is activated and opens up, a counter flow of air is sucked in backwards through the filter bags, thus cleaning all filter bags simultaneously in a very short period. Thereafter, the valve is closed again. Cleaning intervals are normally every 30 minutes, and last for approximately 20 seconds, after which full vacuum is restored. This valve also ensures that, when the unit is started, it starts unloaded and vacuum load is introduced approximately 10 seconds after Star/Delta sequence is ended. All functions for the operation of the unit are controlled from the built-in electrical panel. A robust unit for temporary mobile use. 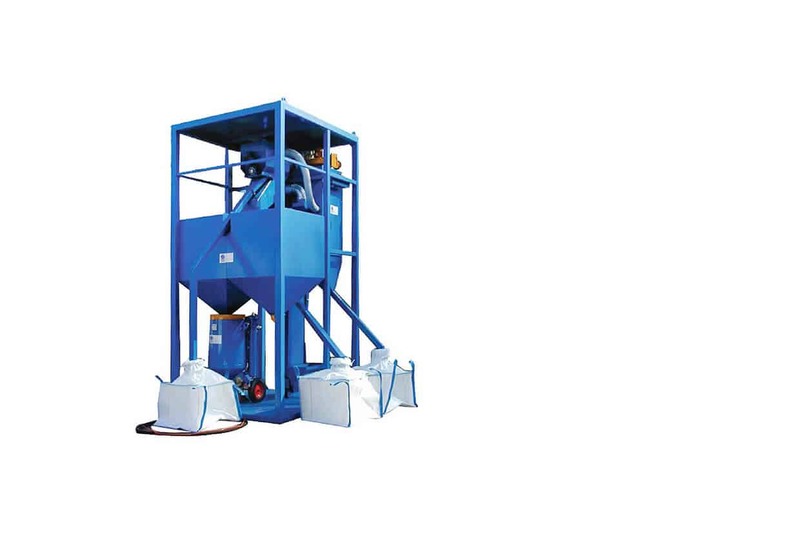 Automatic “big bag” filling of collected material. Power alternatives 16.5 & 25kW. CEE power intake for 32 or 63 A respectively. Filter system for dry and moist material. Automatic ATM filter cleaning system, without compressed air. Complete start/stop and controls system. Compact design and retractable legs offer maximum transportability. Can be placed in the exact location needed using a forklift. Easy height adjustment to suit various builder’s bags. AbVac saves time, energy & money! View the full AbVac Brochure. Read our Harris Pye & Bulldog Marine AbVac case study here. 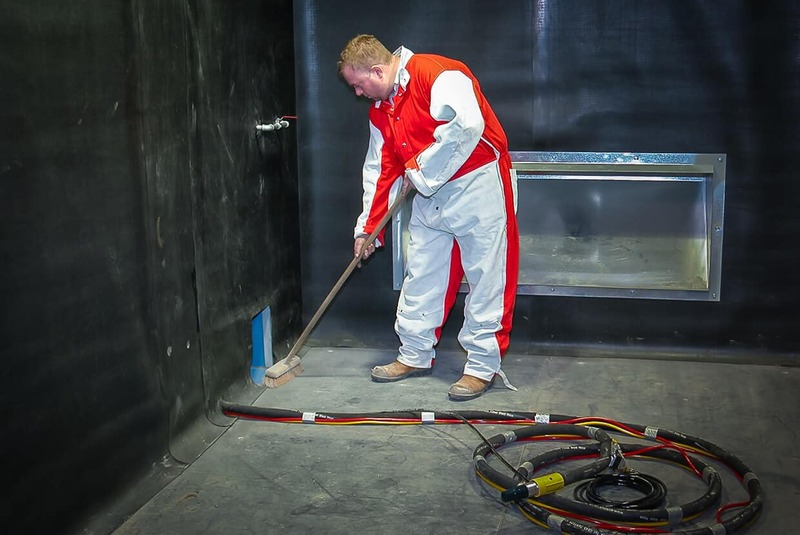 Airblast Eurospray manufactures a range of abrasive storage elevators and screw recovery systems to aid storage and recovery. With its high recovery rate the Vaculift Recovery System is an ideal system for in-house blasting operation. 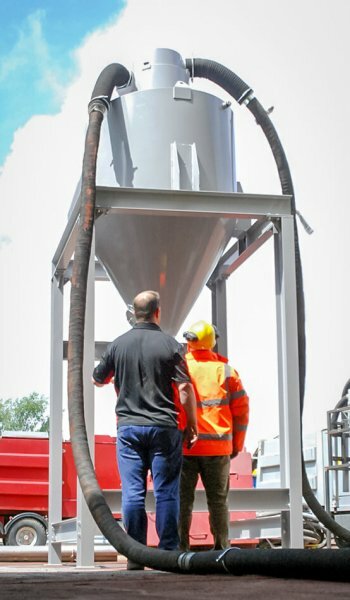 Airblast Eurospray's Garnet Recycler helps to deliver a constant supply of recycled abrasive to improve operator efficiency. 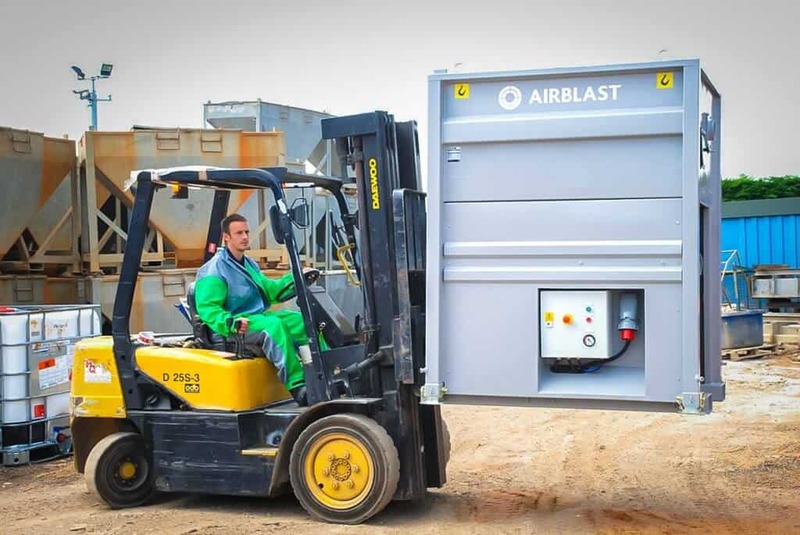 On larger Aerospace projects, Airblast uses the RAM DPS 3000 to separate dense particles.